Well that escalated quickly! The difference between week 26 and 27 looks absolutely insane to me, but maybe that's just because I'm living it? This week has been weirdly emotional. I tried to get into a fight with a dude at Wawa (Chris stopped me - he's no fun), but I also cried because I was so sad that our baby couldn't cuddle on the sofa and watch Netflix with us yet. It is really weird to miss someone who doesn't even exist yet, if that makes any sense? 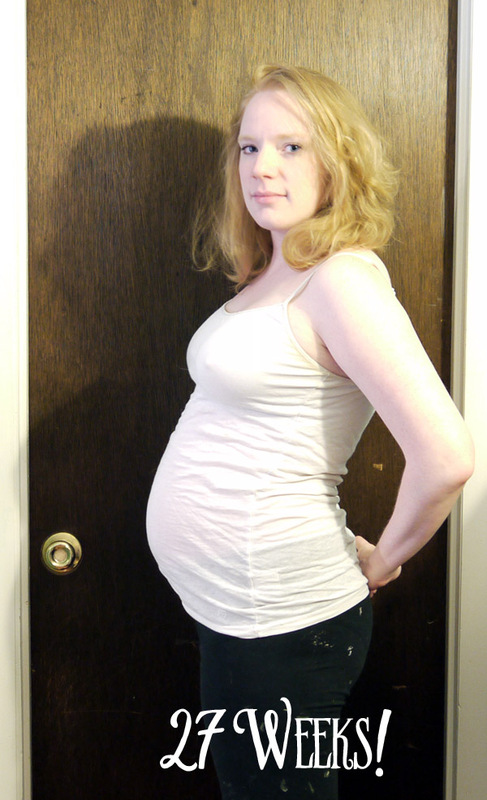 This experience, pregnancy, is entirely unlike anything I expected. I had my one hour glucose screening on Saturday and got my results back today - I failed. I guess they flag anyone higher than 140 and mine was 160. So now I have to go for the three hour test this Saturday. Chris is coming with me, even though I told him he doesn't have to - three hours is a long time to sit around and do nothing. I was reading online and it looks like 180 or higher after an hour is when you really have to worry, so I'm trying to not stress about it too much, but I'm not having much success. I mean, I just don't understand. I eat relatively well, I got to the gym 3-5 times a week, I am exactly on target for weight gain - what am I doing wrong?